Begin by skating on a right back outside edge, with the skating knee deeply bent. Clockwise jumpers should start on a left back outside edge, and should reverse or mirror the rest of these directions. Note that many jumpers find it difficult to simply start the jump from this position - see the tips below regarding "Jump Preparation". Extend your arms into "launch position." The left arm should be straight in front of you; the right arm should be extended at the "5 o'clock" position. Both palms should face downward. Reach back with your left leg; extend it and point the toe down. Plant the toe pick firmly in the ice, preferably just to the right of the arc of travel of your other blade. Be sure to reach back; you don't want to trip yourself. Land on the right foot, on a back outside edge. As you land, extend your arms fully to the sides in normal skating position. Your right knee should be bent and your left leg extended strongly. Arch your back, keep good skating posture, and try to remain on the back outside edge. Smile broadly - it contributes to your confidence level! Stay away from the boards! You greatly increase your risk of injury in case of a fall. Keep good posture! Skate erect from the waist up, not bent over or crouched. Arch your back somewhat; shoulders back and chest out. Keep your shoulders down and your head up; it should feel like you're stretching your neck. Some skaters call this the "long neck!" Watch other skaters who have truly mastered this jump. Pay attention to the things they do. Don't look down at the ice! It throws off your center of gravity. Keep your head level. Relax! You will progress faster and learn the jump sooner if you expect to fall a few times. It may be helpful to start by practicing a safe fall and recovery, to increase your confidence and reduce anxiety. Practice doing this off the ice in slow motion. Skating can be hazardous. Jumps and other difficult elements should not be attempted if you are not stable and comfortable in skates. Body awareness and control are essential. Watch for others when you practice any jump. Plan ahead for your jump landing and exit. Since a Toe Loop is launched and landed traveling backwards, your free leg and the blade can be a hazard to oncoming skaters. NEVER try anything that is significantly above your skating level. 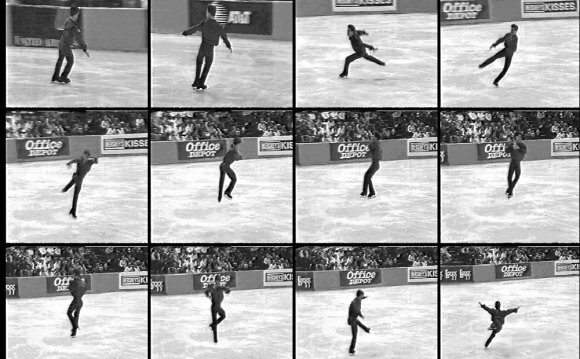 A Toe Loop should only be attempted after mastering forward and backward skating, and becoming comfortable with performing the Waltz Jump. 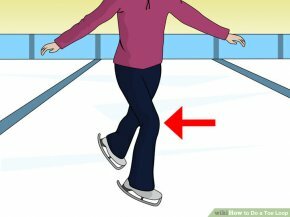 This wikihow entry, or any other, is no substitute for consultation with a qualified professional skating instructor. A coach not only helps you stay safe, but is also a great encourager and can help prevent you from developing bad habits.